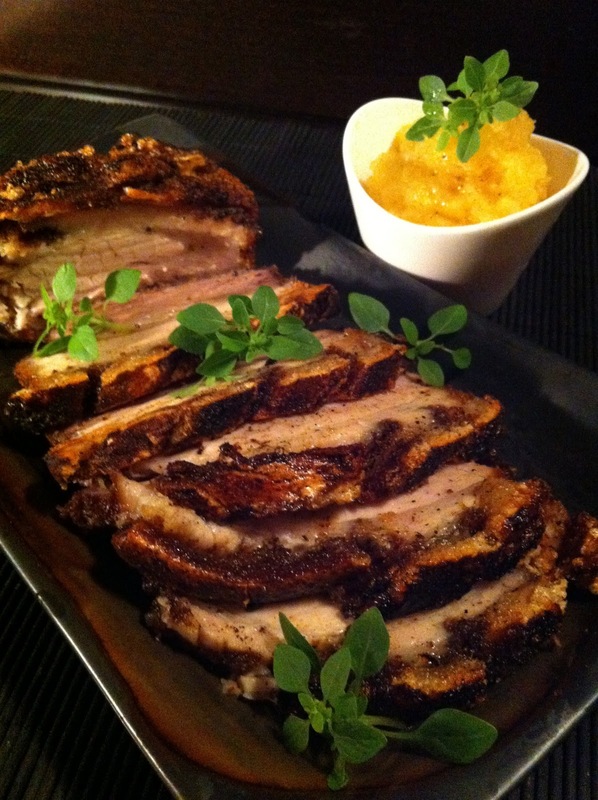 "Oooooo this is the best pork belly I've ever eaten the crackling is just amazing!" My friend purred as he munched his way through lunch the other day pausing briefly only to iPhotograph his repast for later broadcast on a well known social networking site. The two of us had recently reconnected after a long hiatus (an estimated twenty years certainly) thanks to the wonders of cyberspace and now meet for lunch whenever he visits from his adopted hometown, Barcelona. We both share a delight in all things culinary and this time we were at "Roast" that eatery perched in the rafters of Borough Market in south London with the wonderful view of the market stalls below. London's rather feeble answer to the Boqueria. The menu is eclectic contemporary British and was a choice on my part intended to afford him a break from the cuisine of the Iberian peninsula. My first suggestion had been Jose Pizarro's nearby but quickly thought a dose of British contemporary would be more welcome so "Roast" it was, and boy was I right..!! As he continued to sing the praises of the pork to our Polish waiter I felt my delicious rump of lamb has been well and truly trumped and privately vowed to return to order the pork belly as soon as possible! To finish off we chose dessert. Eyeing the selection of classic Irish Cheeses on the menu, Cashel Blue, Ardrahan etc, and not content to leave well enough alone we felt compelled to compliment their inclusion to the waiter "Ah yes" he said with a broad grin, "we like to keep the ingredients as BRITISH as possible!!" OH DEAR! As we strolled back along the south bank the pork belly encounter reminded me that we had recently experimented with the cut and come up with a couple of ideas for in the IF menu. This one is very easy and works well. Make sure skin is bone dry before starting to cook. (Some people rub vinegar into it and leave it uncovered in the fridge for several hours) Score the pork skin with a scalpel or very sharp knife. Mix powders and dry rub the meat making sure you penetrate all the score lines. Place on foil on a baking tray for 1 and half to 2 hours until skin is crispy. If you are still not happy with the crackling factor try leaving the meat under the grill for a few minutes to finish off.